A bit of background:Our last dog was a Labrador Retriever that weighed in at between 70 and 75 pounds. She went through a six week obedience class as a youngster and learned to Come, Sit, Heel and Stay but for health reasons I couldn’t continue with classes which I later greatly regretted. As she got older she pulled on the leash so badly that taking her for a walk wasn’t fun. “Come” deteriorated into a game of keep-away – the closer I got to her, the farther she’d run and she would escape out the door at every chance she had. Every time we took her out it was so stressful that those outings became fewer and fewer. She was a lovely dog in temperament but she suffered from such separation anxiety that we couldn’t leave her in a kennel so we all became home bodies. For all her obedience issues, she was still a wonderful companion. She passed away at the ripe old age of 17. I missed her so much that I couldn’t even consider getting another dog for over a year. Finally that space in my heart was ready to be filled again so the research started. I knew I wanted a medium to large breed dog and one that didn’t shed as much. I narrowed it down to a Standard Poodle or an Airedale and I talked to the owners of every one of those dogs that I met, as well as doing a lot of research on the internet. 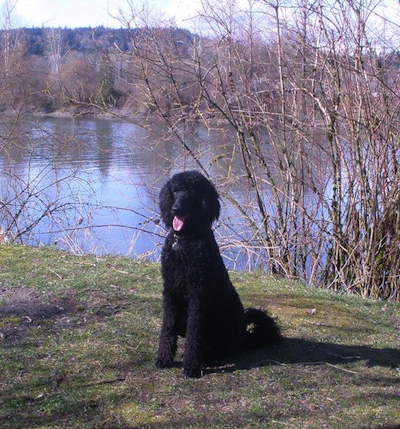 After a year of research I announced to my husband we were getting a poodle and I was sending in the application form to Paris Poodles in Chilliwack – to say he wasn’t keen was an understatement, but it would be my dog, just like the last one so he was out-voted. Off we went for a road trip up the valley and came home with our 8 week old little black boy, Shadow. One thing was certain – this dog would be trained. 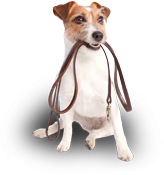 I wanted a dog that was welcome wherever I took him, so while I was searching for a dog breed and breeder, I was also searching for a dog trainer. As it happened there was a link to Sit Happens on the Paris Poodles website – the only trainer they had approved. I clicked the link to check it out. 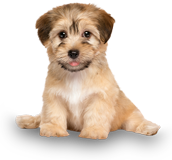 The videos showed the kind of dog I wanted – happy and obedient. 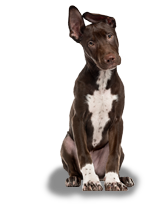 I contacted Jeff and set up an appointment for a demonstration of the Sit Happens method of dog training. We met him and his dog Holly in a nearby park and by the end of the demo I thought “That’s how I want my dog to behave!” We signed up for classes immediately. There were 3 at-home sessions where Shadow and I learned the basics – come, sit, heel and the most important, “place”. He was young enough to participate in a couple of Puppy Play Dates, and then we started taking him to the weekly park classes. Shadow and I love the park classes so much we have only missed 1 class since we started. Shadow has become the love of our lives. He’s 10 months old now and weighs 54 pounds. Remember the husband who wasn’t keen on getting a dog? He’s the one who takes the dog everywhere he goes, including on sales calls, and makes sure he gets a walk on the dykes every day (he’s mostly retired, I’m not). He walks off leash most of the time and walks beside us, right past other dogs and people. He also comes immediately when he is called. When he’s on leash there is no pulling on the leash. 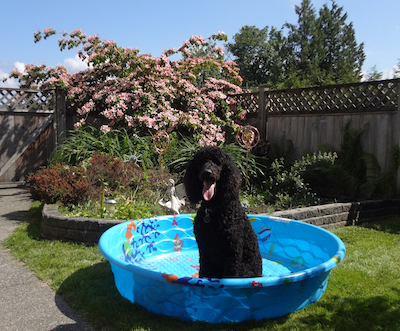 He will “place” anywhere – on a log, a picnic table, park bench, in his pool or on a mat in the kitchen while I prepare dinner. When we leave him in the car he waits patiently until we return with no barking or lunging at people who walk by. When I come home from work I’m greeted with a wagging tail and a big dog smile. Can you tell I’m proud of him? Many thanks to Jeff, Marilyn and Juergen!Without their talents as trainers of dogs and their owners, our lives as Shadow’s “parents” would not be half as joyful and fulfilling.